I’m Better than New! Just Kidding! It’s Spring, Not Fall, Right? Welcome to my weekly adventure to “Occupy the Blog-o-Sphere” each Thursday. I offer this hopefully uplifting picture and message to brighten your day and bring something buoyant into your life. As you move through your day with a renewed outlook, may you pass it along. 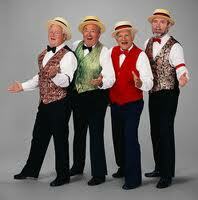 April 11 is National Barbershop Quartet Day! Now there’s something to sing and tap your toes about! They're taking requests, folks. Go ahead and have these fancy gents sing you your favorite Golden Oldie (and I do mean Oldie)! Barbershop Quartet Day honors four guys with great voices that blend perfectly–their outfits don’t blend so well, but their voices sure do. This day celebrates the founding of the Society for the Preservation and Encouragement of Barbershop Quartet Singing in America in Tulsa, Oklahoma on April 11, 1938. Barbershop Quartets date back to the early 1900’s in America. Barbershop quartets are popular in some areas of the country, especially those favoring straw hats and bow ties. Musical selections are usually happy and naïve…innocent (no rap, hip-hop, or ska, and crotch-grabbing during the performances is strictly forbidden), and allow full use of the voice ranges and skills of these talented singers. Competitions at local and national levels encourage these groups to flourish, or at least perform regularly. Celebrate today by listening to a Barbershop Quartet, either live or recorded. This may take a little schedule-juggling on your part, but isn’t some good old-fashioned harmony worth it? Give it a try! Click here for a YouTube video of a delightful Barbershop Quartet if you’re too busy to find a real one in a venue near you. Click on this link to find out more about joining this cyber-movement to lighten up and brighten up our world so you can decide if you want to be part of it. You always have something so nice to say, Janice. Thanks! When I started researching this, I thought these quartets were fairly obscure and limited to old men. Not so. Many young people sing in the a Capella groups. They may not call themselves “Barbershop Quartets” but they sing the same style songs and there are competition world-wide. I was quite impressed with how popular they are. You’re so welcome. The blend of voices is amazing. And no musical back-up–now that’s talent! I had forgotten about barbershop quartets. I used to know a couple of old guys who sang in one here in my town. I always thought it was a special kind of group and a special kind of sound. Thanks for reminding me! Big smile. I hope this will never be a lost art! Then my work here is done for the day! A bit of history to remove those cobwebs from the brain. Teacher, can you give us more? Well, at least the link your provided had them some matching outfits! They sounded fantastic 🙂 and thank you for sharing this! This singing has been a favourite of mine from the first time I heard a group of barbershoppers. They always seem to be having a blast. You wild and crazy gal, you! How fun! I love to go listen to my own town’s barbershop quartet. When I’m not too busy preparing for the Kansas Square Dancing Convention that is.